"I love you Daddy. You rest now. " 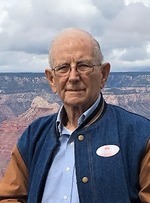 Lester C. McDaniel , 81 of Phoenix, AZ passed away on November 19, 2017 at 7:00 pm at the Center of Arrowhead Rehabilitation Center in Phoenix, AZ after a 19 month battle with Cancer. A small, intimate close family celebration for his life will be held on Friday, November 24, 2017 at 2:00pm at his favorite scenic overlook located 20 miles South of Munds Park heading North to Flagstaff per his wishes. Services for his final resting place will be in March of 2018. He will be laid to rest in the Fairview Christian Church Cemetary in Murphysboro, IL, Jackson Co. He will be laid to rest along with his Mother, Janetta Marshall and step-father, whom he loved and respected as his Father, Jess Marshall. Lester was born on June 3, 1936 in Granite City, IL to Janetta V. Marshall and Norman L. McDaniel. He was widowed to his late wife Connie McDaniel. He was retired but prior was an electricial wire spool maker. He was a member of the “International Brotherhood of Electrical Workers" Local Union #1 for over 25 years. He loved his family, fishing, camping, outdoors, playing jokes and just making people laugh. He is very intimately and forever remembered by his family as “The Best B.A.G Ever”. Lester is survived by his eight children Carla Balderamma (AZ), Colleen Roth-McDaniel (AZ), Catherine Ochoa-McDaniel (OR), Christina McDaniel (AZ), John McDaniel (OR), Joseph McDaniel (OR), Jamison McDaniel (NC) and Matthew McDaniel (CA); 19 Grandchildren and 24 Great Grandchildren; his sister Barbara Wheetley from Blodgett, MO and her husband Kenneth Wheetley; and several other family members . He is also preceded in death by his Father, Norman L. McDaniel; one sister, Valeda McDaniel and one brother Charlie McDaniel.